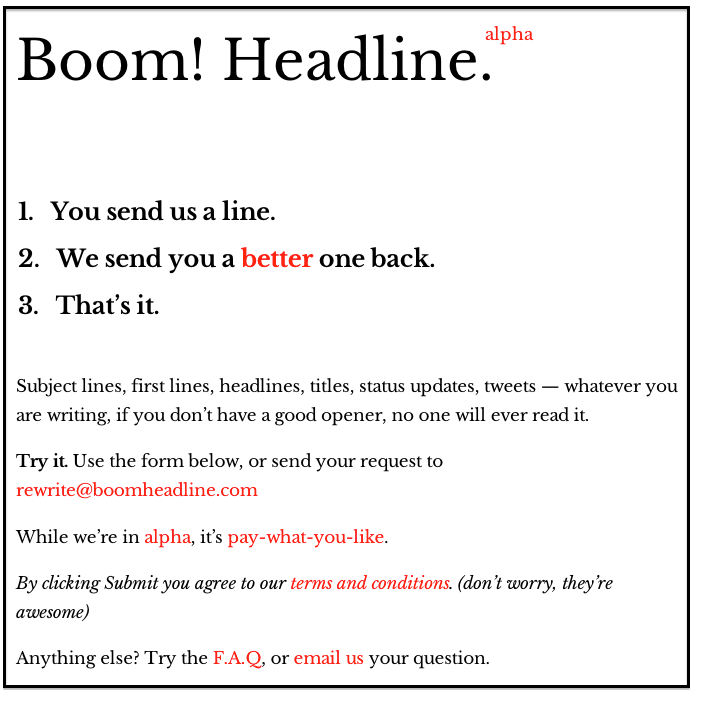 Get Copywriting Help—Fast—With Boom! Headline | Brand On! Are you struggling with how to write something? Wouldn’t it be nice to have a professional writer’s input to make it the best, snappiest copy possible? My friend Patrick McLean of Good Words, Right Order has launched a great new service called Boom! Headline. It’s like a help desk for copywriting: You send him something you’re working on, and he will send you back a critique and his suggestions. This will help you get unstuck or quite likely find a better way of saying what you’re trying to convey. What is this thing the Lord made? What is this Work of God? Check it out. That God-dude made somethin’ cool! Check it out. That God-dude made somethin’ wicked trippy! Good Lord, what fresh digital plague have you now sent to scourge the faithless luddites among us? Cost: For now, it’s pay-what-you-think-it’s-worth. You’ll want to earmark a slush fund to run stuff by Patrick—he’s that good.